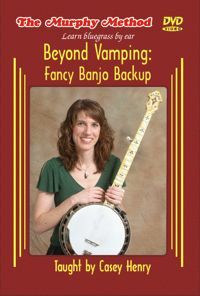 Beyond Vamping: Fancy Banjo Backup: Ho-hum. Yawn. Bored with vamping? Wish there was something you could do to spice things up? There is! This DVD starts off with a couple of simple vamp decorations and then moves on to those fancy backup licks you hear on record. We don’t just teach you the licks, we show you how to put them into songs. All taught note-for-note. Backup will never be boring again! No tab.